The government owns the forest. It also owns the statistics on forests. Government sources sporadically throw up reams of information related to forests, which is often difficult to decipher. But now a group of independent researchers has decided to make people understand the country's forest facts better. They have used these statistics to build comprehensive indices of forest health that quantify India's green wealth beyond the obvious forest cover statistics. Green Indicators 2004 , a report developed by a Noida-based group called Inscriptions, is an unprecedented effort. The study examines three aspects -- forest cover, recorded forest area and protected area coverage -- to arrive at two indices. One of them is the Green Wealth Index (gwi), a composite index of empirical data. It is an indicator of the green wealth possessed by a state or union territory. The other is the Green Protection Index (gpi), a qualitative calculation of high protection accorded. This is an indicator of what is being done to protect the green wealth. The indices reveal interesting facts (see table: Status of India's green wealth). The Andaman and Nicobar Islands are the richest in terms of their green wealth, with the gwi at 0.747, while Sikkim does the most to protect its natural heritage -- it ranks highest on the gpi scale with 0.903. Both indices are on a scale of zero to one. The all-India gwi is a dismal 0.193. The report is based on two primary sources, the State of Forest Report, 2001, and Wildlife Protected Area Network in India: A Review (Executive Summary). Subir Ghosh of Inscriptions has authored the report, and M K S Pasha of the Wildlife Protection Society of India -- a Delhi based non-governmental organisation -- has been closely associated with the its development. The document also uses facts and figures from three other national level reports and surveys: the Census of India 2001, Economic Survey 2002-03 and National Human Development Report 2001. Ghosh recollects: "When I was almost through with the first draft of a book on Indian wildlife, I wondered how the states could be ranked in innumerable ways for their forest health. What one ended up stitching together was the Green Indicators 2004." Pasha adds: "While we have done our computations, we also appended the raw data accessed along with our statistics in open format, which can be used by others the way they want. We wanted to make life easier for others, maybe ensure they don't have to repeat the exercise we had to undertake while making this report." It is possible that some people may challenge the innate simplicity of Ghosh and Pasha's indices or the fact that they decided to ignore any debate on the data itself. 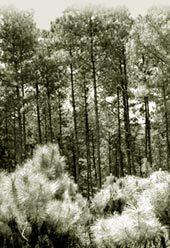 Their adherence to the categories used by the government to artificially classify the forests might also be criticised. But the effort marks a beginning. Here is an example of what can be done by turning millions of gigabytes of mundane information into edible morsels. It has given everyone a list of ingredients to improve the recipe the next time over.